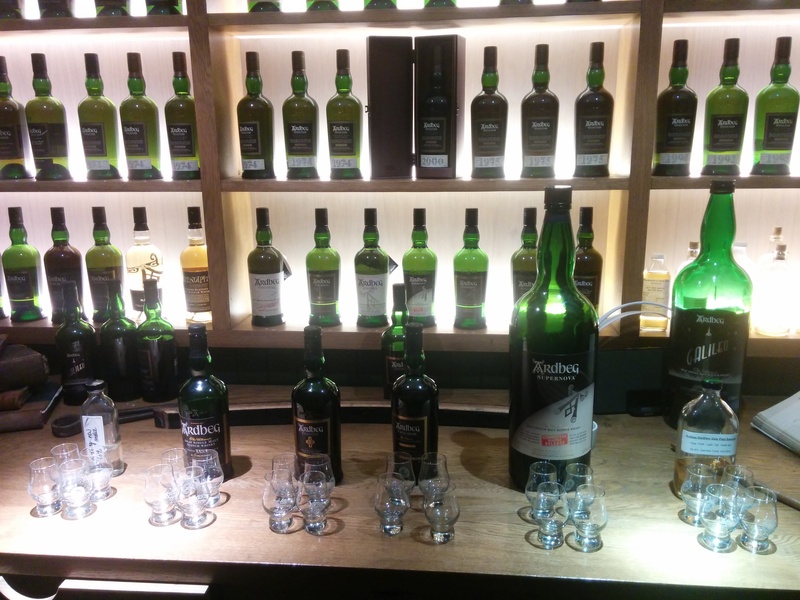 For my fifth review, I will be showcasing the five whiskies that I sampled during my visit to the Ardbeg distillery as well as the special new make spirit which forms the heart of all Ardbeg whiskies. The tasting menu at Ardbeg. From left: Ardbeg new make spirit, Ardbeg 10 Years, Ardbeg Kildalton, Ardbeg Uigeadail, Ardbeg Supernova 2014 Committee Release and Ardbeg 1994 Cask 728 Sample. Nose: Briny, maritime notes with quite a lot of sweet peat. Strong hints of vanilla intermingled with some citrus fruits. Very inviting. Palate: Initial peat blast saturates the palate with smoke before subsiding slightly to allow the vanilla and citrus notes to surface. Another wave of peat follows, but not as strong as the initial salvo. Oily mouthfeel and yet somewhat drying at the same time. Finish: Medium to long finish with the peat slowly fading, leaving behind the briny notes and some ash. Very very good whisky and one of my go-to drams! Nose: Stewed red fruits with a hint of sea salt. Smoky, peaty goodness with some sherry and vanilla influence. Very intriguing nose. Palate: The sherry influence is definitely the star, creating a nice balance between the sweetness and the smokiness. Sherry sweetness combines nicely with the smoky peat and the stewed fruits. Slowly gives way to some briny notes and more peat. Quite oily on the mouthfeel and coats the palate well. Finish: Medium to long finish with the sherry and the peat trading punches to provide a nice sweet-smoky balance. Quite a treat. Nose: Sweet peat with a definite sherry presence. The higher abv is noticeable in the nose, with some spiciness intermingling with dark cocoa, demerara sugar, espresso and some cereal notes. Very enticing nose. Palate: Woah! A lot of things going on with this one! Sherry sweetness and stewed fruits giving way to citrusy notes. The maltiness comes to a fore toward the midpoint before the signature Ardbeg smokiness takes over. Oily mouthfeel that coats the palate very well. Finish: Very long and lingering finish, with the sherry sweetness and the peat smoke battling one another. Hints of cocoa and sugar towards the end with some espresso bitterness. Bloody good dram! Nose: Peat monster! The trademark Supernova blast of peat at the forefront, although somewhat tempered by the sherry influence, which brings about a sweeter side to the nose. Somewhat herbal and savoury with some phenolic elements. Just a hint of TCP. Palate: Not as peaty as the nose suggests, but with a good amount of spiciness. Coats the mouth completely and possesses more of a dry mouthfeel than other expressions. The sweetness of the sherry emerges, but is rather restrained. Peat smoke intermingled with dark chocolate and briny notes. Some of the TCP from the nose begins to emerge towards the end. Finish: A one-two combination of sweet peat and sherry sweetness, albeit not as strong as the Uigeadail or Kildalton. Dark chocolate, cigar ash and some mint at the very end. A very complex dram. Nose: Bourbon sweetness with the signature Ardbeg smoke. Hints of lemon, sea salt, tobacco pouch and pepper. Palate: Peat smoke at the forefront, but more reminiscent of the Ardbeg 10 Years. Quite a refined character which most likely comes with the age. Citrus fruits and briny notes are in control here, with just a hint of cigar ash and spiciness. Finish: Medium to long, with more lemon citrus notes and tobacco pouch apparent. Elegant smokiness towards the end. More-ish. Quite sophisticated. Nose: Smoky, peaty goodness with a strong citrus presence. Malty notes with some brine. Clean, unadulterated nose. Palate: Quite spicy, with smoke and citrus ebbing and flowing. Needs water due to the high abv. TCP, sea salt and peat taking turns to inundate the palate. Drying mouthfeel. Finish: Long and very spicy finish with the citrus showing up once again towards the end. Considering the difference between this and the 10 Years, the importance of the ex-bourbon casks cannot be understated. Quite an interesting look at the spirit which forms the heart of all Ardbeg whiskies. What conclusions did you come to, Brendan? What were your favourites? I must say, of the core range my favourite is the Uigeadail, though the Alligator I tried on my tour would probably pip it. How did you find the Supernova, though? I’m quite partial to the Uigeadail as well mate! It’s a wonderful whisky to have around and the sherried sweetness mingled with the peat smoke is a surefire winner! The Supernova was quite interesting actually, considering that the 2014 version is lightly sherried while the 2009 and 2010 versions are not. I thoroughly enjoyed the 2010 version which I tried some time back but the 2014 version is also quite good. The sherry has smoothed the nuances within the whisky and given it a level of sophistication which I believe would make it the perfect after-dinner dram for peat heads. Yes i think for us lesser mortals , the ueigadal is the best whisky i ve had for its rate , it made me feel rich and as though i owned the world for a while [pls note : no cocaine influence,ha ha], the only thing that beat this whisky for the same rate is the Laphroaig AN CUAN MOR. DO NOT MISS THIS !!! Haha fair description and I too love the Uigeadail (although it has been a while since I last had it)! Have yet to try the An Cuan Mor (primarily because paying SG$125 for it at Duty Free vs SG$102 for the PX Cask is usually a no-brainer haha) but I will definitely get to it one of these days. Thanks for the heads up!